"The Liverpool Sound came to Manchester last night, and I thought it was magnificent... The spectacle of these fresh, cheeky, sharp, young entertainers in opposition to the shiny-eyed teenage idolaters is as good as a rejuvenating drug for the jaded adult." He also later interviewed Brian Epstein, and besides covering Beatles concerts, he was ghost-writer for a regular column which was billed as being written by George Harrison. He was a natural choice, therefore, to be called upon to help Brian Epstein write his autobiography, A Cellarful of Noise, in 1964. He shortly thereafter became Brian Epstein's personal assistant, scriptwriter and Beatles press agent and spent six months travelling the world with the Beatles. Taking what he learned from Brian and his Beatles experience, he then moved to Los Angeles and started his own public relations company in 1965, managing the publicity for bands including Paul Revere and the Raiders, the Byrds and the Beach Boys. He also was a co-creator and producer of the historic Monterey Pop Festival in 1967, the first such event of its kind. Derek returned to London in 1968 to be the press officer (in-house publicist) for the newly created Apple Corps, responsible for media relations for the Beatles and all the artists on the Apple label. 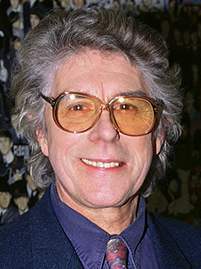 During this time he also assisted John and Yoko in their peace campaign, becoming, in effect, their propaganda minister, helping to spread their message to the world's media, and he became forever enshrined in song when John rhymed "Derek Taylor" with "Norman Mailer" in the song Give Peace A Chance. Derek continued at Apple until he was ousted during the Allen Klein takeover of Apple in 1970. However, he stayed friends with the Beatles, particularly George, on whose I, Me, Mine autobiography he collaborated. Derek went on to become director of special projects at WEA Records (the UK amalgam of Warner-Reprise, Electra and Atlantic Records) where he was responsible for marketing and publicity on a handful of select artists such as Alice Cooper, America and Carly Simon. Independantly he also produced records for artists such as Harry Nilson. He was subsequently appointed Joint Managing Director of Warner Bros. Records (UK) and then in 1977 he was transferred to Burbank as senior Vice President of the American parent company. It was while he was in L.A. that he devoted a lot of time and creativity to the marketing of the Rutles' first album. Over the years he wrote several books about his life, the Beatles and the phenomenon of the sixties, including As Time Goes By, Fifty Years Adrift and It Was Twenty Years Ago Today. Derek was lured back to work at Apple in the 1990's to devise and execute the publicity and marketing strategies for the Live At The BBC album and then for the entire Anthology project. He also wrote the liner notes for all the CDs and videos. The success of his latest campaigns showed that he had lost none of his skills over the years. After a brave struggle, he died of cancer in September 1997. "The kids of AD 2000 will draw from the music much the same sense of well being and warmth as we do today. For the magic of the Beatles is, I suspect, timeless and ageless. It has cut through differences in race, age and class. It is adored by the world." In this interview soundclip, Derek Taylor talks about the attraction of being part of the Beatles experience in 1964. 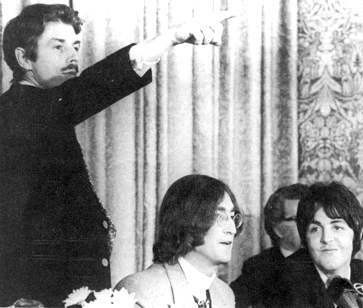 In this soundclip, Derek Taylor talks about the thoughts and feelings of the sixties. Here, Derek Taylor remembers the music, love and peace of the 1967 Monterey Pop Festival. Biographical info from the book The Encyclopedia of Beatles People by Bill Harry, Everybody's Talkin' Bout... Derek Taylor by Martin Lewis from the new version of A Cellarful of Noise by Brian Epstein, and the forward of As Time Goes By by Derek Taylor. Special thanks for help on this bio from Beatles Historian Martin Lewis who was Derek Taylor's assistant in the UK in the early seveties.